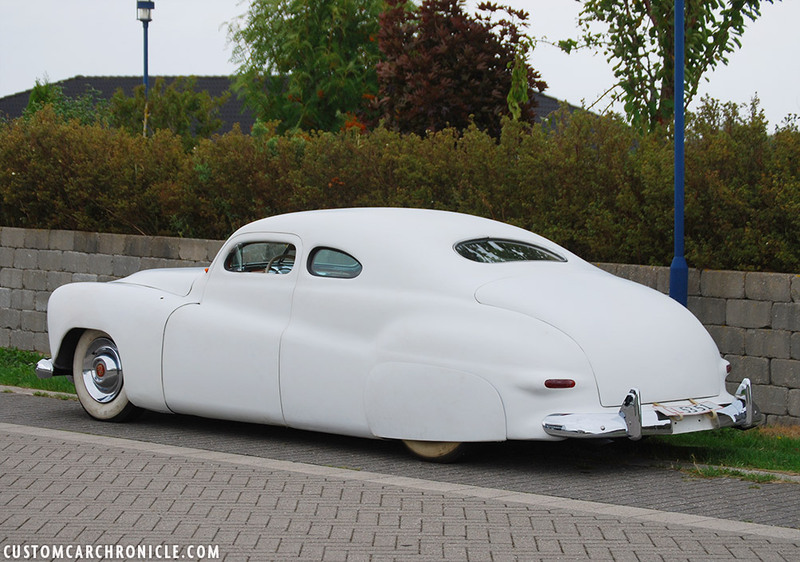 In 1950 George Barris painted the Jack Stewart Ford in white primer after he had fine tuned the Ayala restyled coupe. In 2018, 68 years later, the car is back in white primer, and almost ready to hit the road. On August 19, 2018, me and my 13 year old son were leaving the house early for our first real roadtrip together. 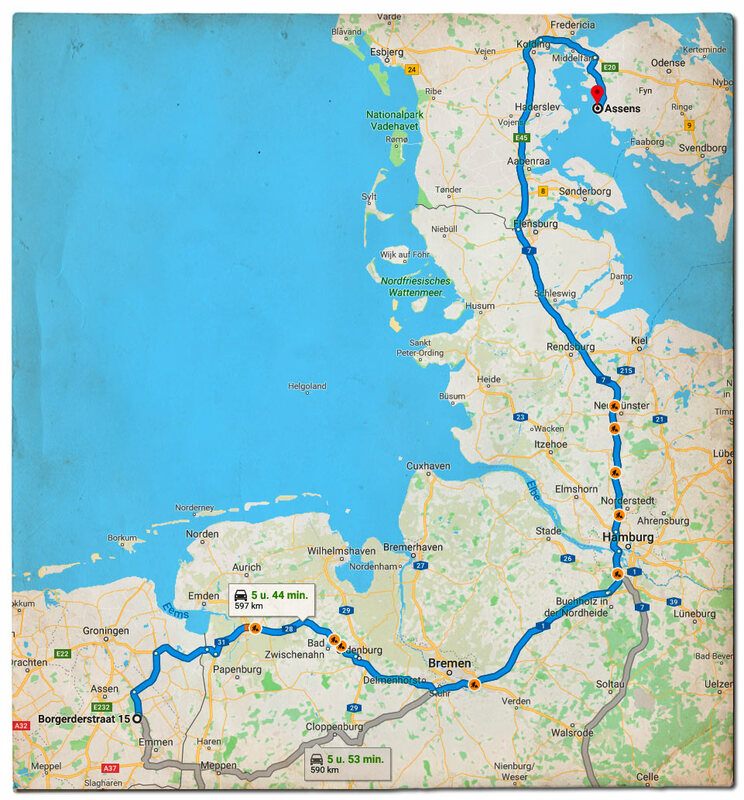 We planned to visit my good friend Palle Johansen in Denmark, a good 6 hour trip, and visit the German city Hamburg on the way back the following day. Palle Johansen and I have been friends for many years, and the friendship intensified when Palle decided to become the new caretaker of the Jack Stewart 1941 Ford. An iconic Custom Car Restyled originally by Gil and Al Ayala in the late 1940’s and fine tuned and painted by Jack’s friend George Barris in 1950-1951. It had been a few years since I had visited Palle, so I was looking very much to see him again, and Abe was really looking forward to meet him for the first time. 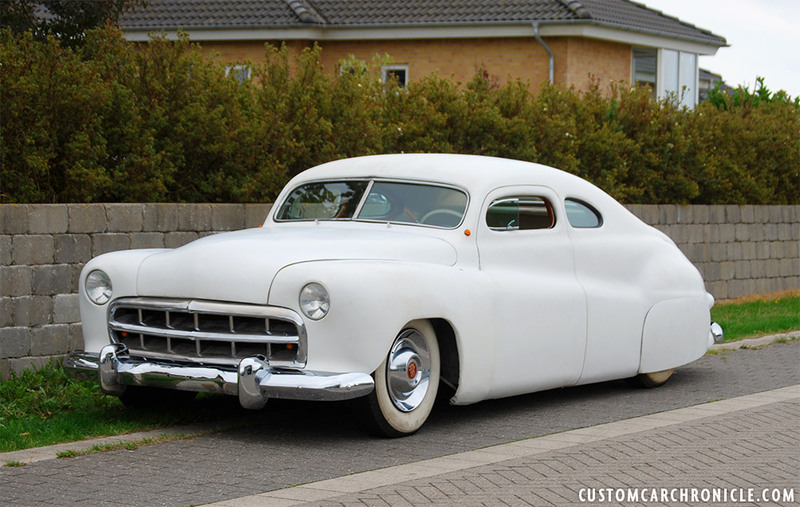 Palle had been working on his ‘1947 Cadillac Custom Convertible mostly in the last couple of years, but the project was sort of halted due to some paint issues, and the Jack Stewart Ford had been on the backburner most of the time he worked on the Cadillac. 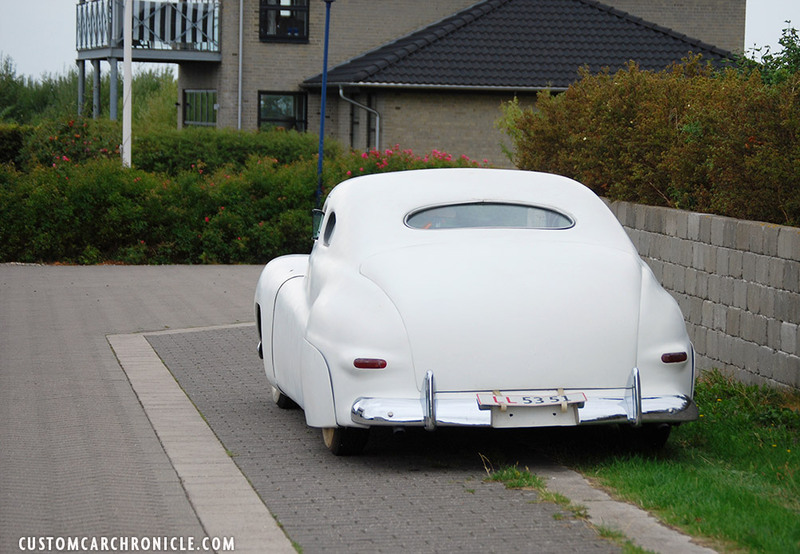 We drove to the end of the street, and saw the white ghost Jack Stewart’s white primered ’41 Ford in all its glory…. I had not expected to see the car being parked on the road. I knew it had been painted white primer some time ago, but I had no idea Palle and his team had “secretly” put it back together again and made in road worthy. 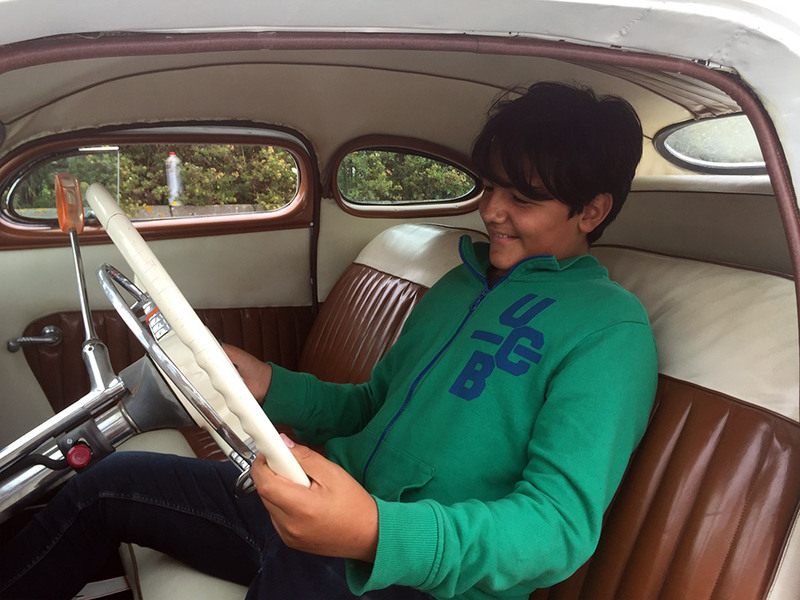 This was an amazing surprise for me, and of course for my son who, for the first time in his life, was looking at an original Custom Car from the 1950’s that had been created by the top shops of the time… And the car that had been the lead character in the book his father created a number of years ago… And which owner, builder an all other connected names had been mentioned frequently in the house, and where he had witnessed all the steps leading to the printed Jack Stewart Ford Book. And now he saw the car in the flesh. 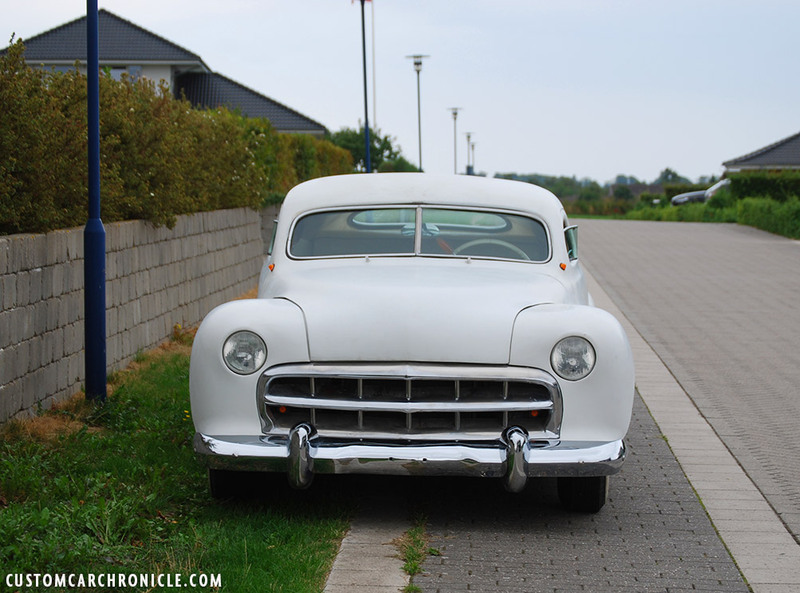 The view we saw when driving up to Palle’s house… the Jack Stewart 1941 Ford in white primer, with temporary Danish License plates. When Jack Stewart had brought the completely Restyled, yet still unfinished ’41 Ford from the Ayala Shop in East Los Angeles to the Barris Shop in Lynwood in 1950 he asked George if he could try to get the car done for him in time for the annual Easter event at Balboa Island. A very popular event for young guys and girls, dancing and partying the long weekend. George worked hard, fine tuning the work the Ayala’s had done previously, rounding corners, reshaping fender lines, crafting taillights and pods for the to sit in etc. But in the end George did not have enough time to actually paint the car, so he ended up painting the car in white primer, and that was how Jack took it to the Balboa Easter Weekend… And it looked really amazing in the bright white primer. Several photos of this version of the car were made back then, survived and were using in multiple publications since then. 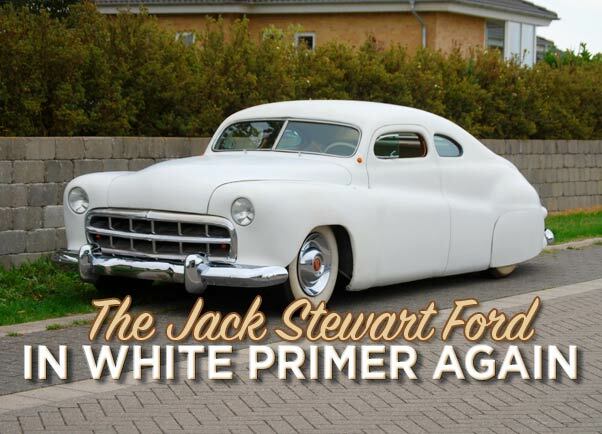 Quite possibly Jack owned and drove his Restyled Ford wearing white primer longer than when George Barris eventually painted the car in a copper bronze color. 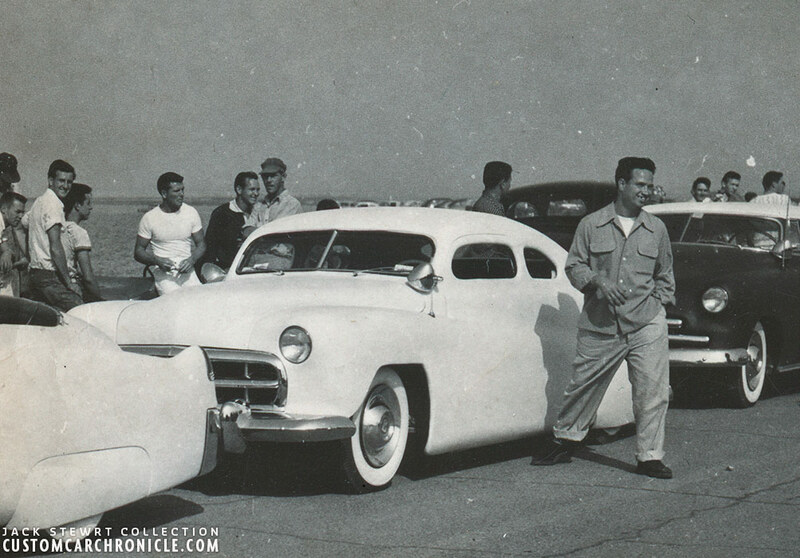 Jack Stewart with his freshly white primer painted 1941 Ford in June 1950 at the Santa Ana Drags. This is how Jack drove it for a few month. It had always been Palle’s intention to go the same route when he was going to restore the car to how it originally looked. Do the complete restoration, and finish it in white primer, then drive it around for some time, before eventually pant it copper bronze. It was a common thing to do back the, have all the body work done on your car, add primer, and then drive it around for some time letting all the body work settle, and get all the bugs, if there where any come out and fix. At one time they, not sure who was first, really liked the idea of the white, or later color tinted primer. And by painting your car in primer first, have it on the road, and even in some shows you could later do the complete debut thrills all over when the car got completely painted. Double fun! 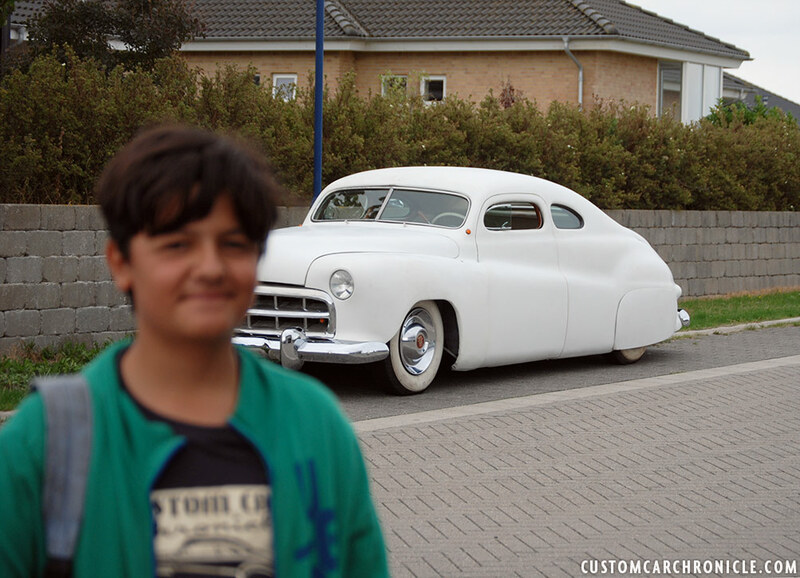 My son Abe shortly after he got out of the car and was ready to check out the Jack Stewart Ford in person. Smiling from ear to ear. There is still a lot to do, notice the cuts and uneven surface on the inside of the door jamb. The white primer on the car right now is however not yet the final primer. It was added to finally cover the bare metal, keeping it from rusting, and make it a bit easier to see what still needs to be done to the body to get it ready for final paint. And the white primer has made it very obvious that there is still a lot that needs to be done. The plan for now is to get the car ready for the Danish version of the DMV inspection. Hence the grille opening and A-pillar mounted parking lights. Both will be removed again after the car has been approved for the road. Then when the car can be driven on the road legally the plan is to tackle all the issues still left, body work fine tuning as well as mechanical work. And while doing that, the car can still be driven around and enjoyed. After checking out the car a bit, Palle said… “are you guys in for a short drive?”…. Oh yeah… we are. The car is not road legal, so we could only stay on the block he said. The Cadillac Flathead engine also needs some more work done to become reliable, and get a new air-cleaner than can be hooked up to the special carburetor allowing the air-cleaner to be mounted on the side, since there is no space for it on top with the channeled body and new low hood. But it runs, and the car can be driven. This was only the second time the Jack Stewart Ford was driven since the restoration got started. Man, what an experience. 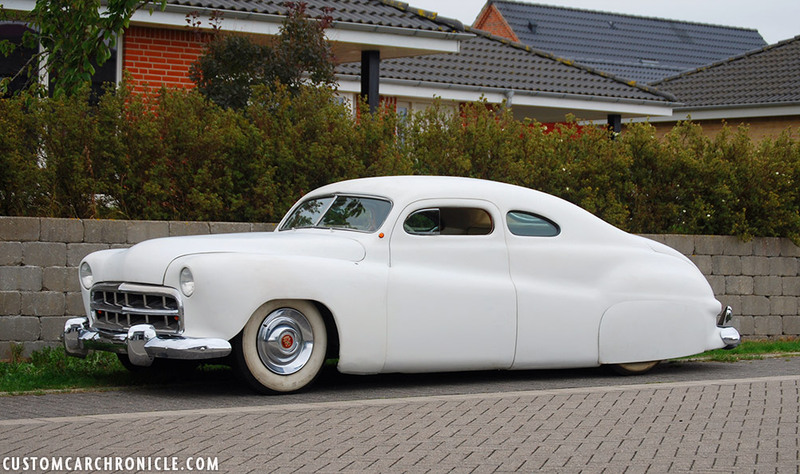 The white primer, chrome and the green tinted glass was the perfect mix. Notice the small turn signals that were added to the lower A-Pillars, where the Appleton Spotlights should be. This is needed to get the needed paper work to make the car road legal. With the papers in hand the Appleton’s will be replacing the lights later. When the car was originally Restyled the techniques used and demands for perfection were a bit different from today’s standards. The Custom Cars back then looked absolutely amazing, but most of them were r created to be looked underneath, inside behind panels, or shown with opened hood or trunk. Modifications as rounded corners looked perfect from the outside, but when you opened the trunk you would see that George Barris, in this case, used only sheet metal to fill in the body panel to create the new rounded corner, but there was no work done to make it looks factory finished on the inside, with a beautiful lip, like we are so used at today. 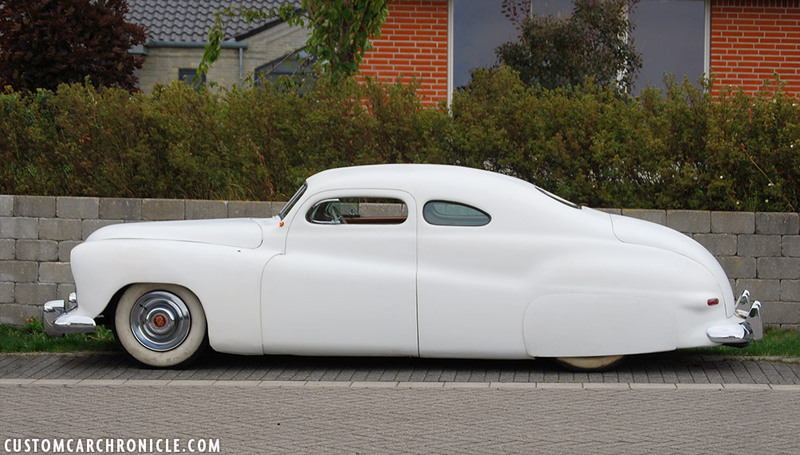 The idea is to keep most of the “flaws” on the car, make it look amazing from the outside, and in the cockpit, but retain the kind of rough around the edges standard quality custom work from the early 1950’s. 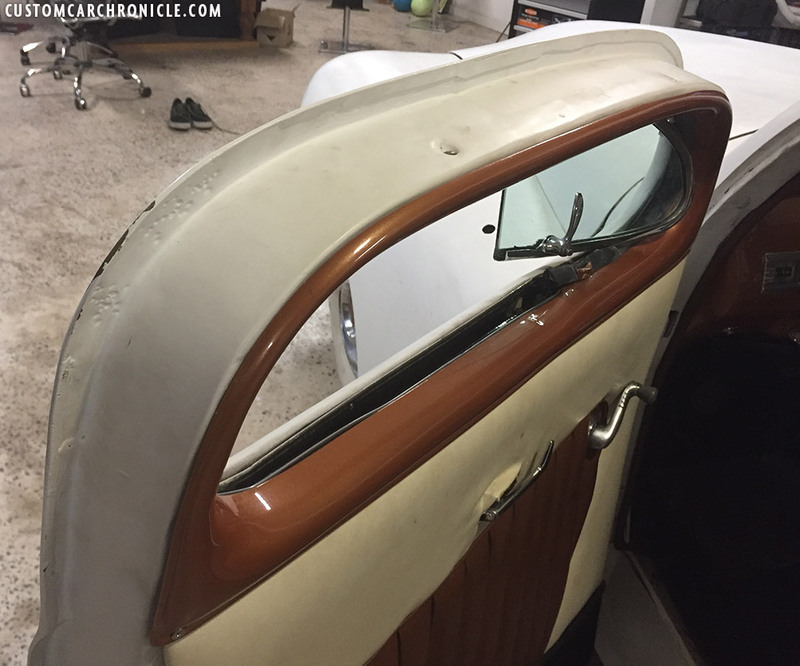 The flow of the fade away fenders and top are perfect… the white primer shows that off so much more than how I saw it last time.. in bare metal. The Stance still needs to be adjusted a bit… a little higher in the front, for that perfect speed-boat stance. The Bob Hirohata hand made taillights contrasted with the white primer. 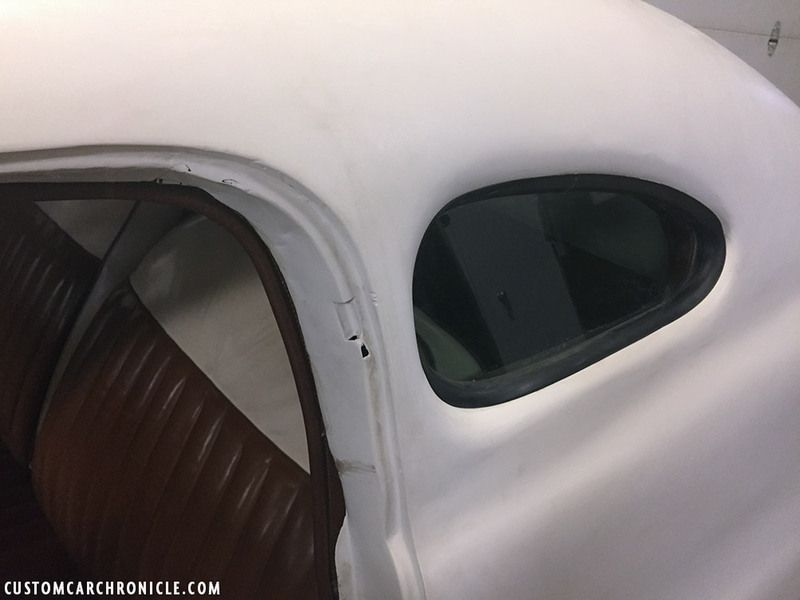 The white primer also revealed that the drivers side front fenders must have had some impact back in 1954 when the car hit a train. And it was never really fixed right, making the sides slightly out of shape. So some metal work will have to be done there to make the front fenders flow nice into the fade away door sections. Palle and I talked a lot about the car the day we arrived, he had driven it into his under the house garage / man-cave so we could check out all the details, while discussing the,details and remembering the good times we had when we were researching the car in the US in 2010. The next morning Palle had some appointments early in the morning, and would be back after a few hours. During that time I walked around the Ford, took pictures inside and out, took some measurements and most of all sat inside the car, behind the Mercury Monteray steering wheel and tried to visualize how it must have been for Jack and later Jim Skonzakes, to drive around in this car, driving around in the streets of Los Angeles, California, and Jim later i Dayton Ohio. Or ultimately how it must have been for Jim Skonzakes to buy the car from Jack, with the help from George Barris and then drive it in a couple of days from LA to Dayton. 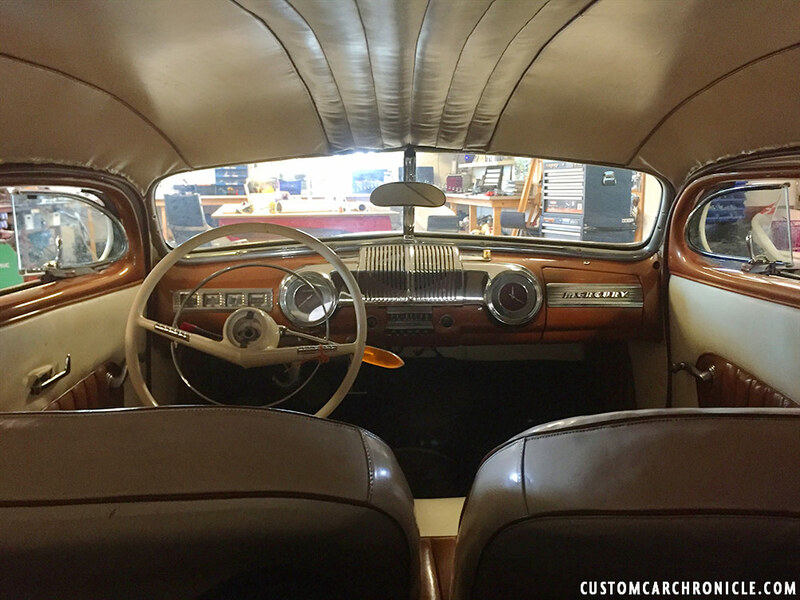 It was an amazing feeling sitting inside the car, knowing its history, siting on the same vinyl tuck & roll upholstered seats as Jack, Jim and later Bob Drake had done back in time. A view from the rear seat. The headliner and seats are still the originals from 1951. The vent windows now work perfectly with all new rubber. More rough work on the door jamb where some of the lead had to be removed to be able to get the doors aligned again. The dash and garnish panels were painted in 2013 by David Martinez / Billy Crewl in time to be shown at the 2013 GNRS. The interior panels are the original units from 1951, semi restored. The white primer makes all the rough body work stand out extra good. Some of it will stay, since it was like this when the car was originally finished. On the other hand, some will be smoothed, since multiple layers of primer and paint back then must have helped smooth out the body work in 1951. 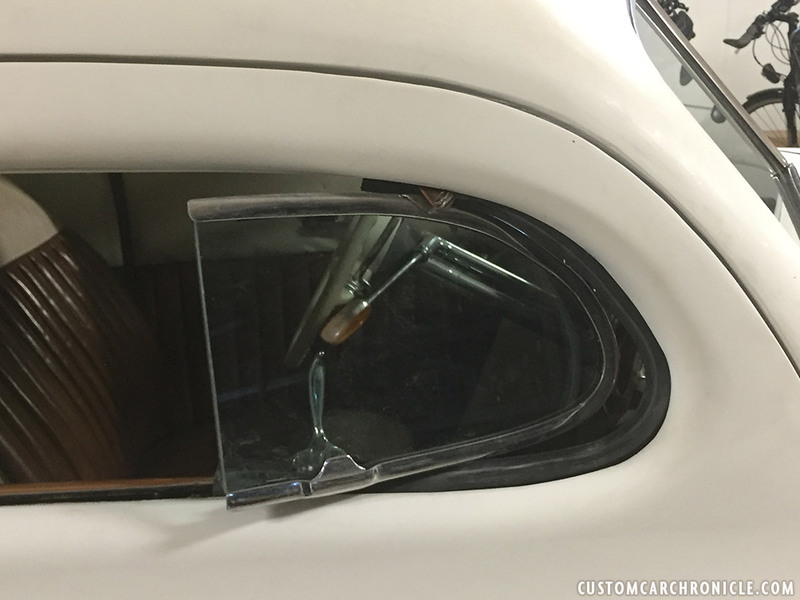 Parked in Palle’s garage… and getting the replica 1951 California License plate mounted. Really looking forward to the next phase on this project… registration, then slowly fixing the body and other things to get it on the road to enjoy. 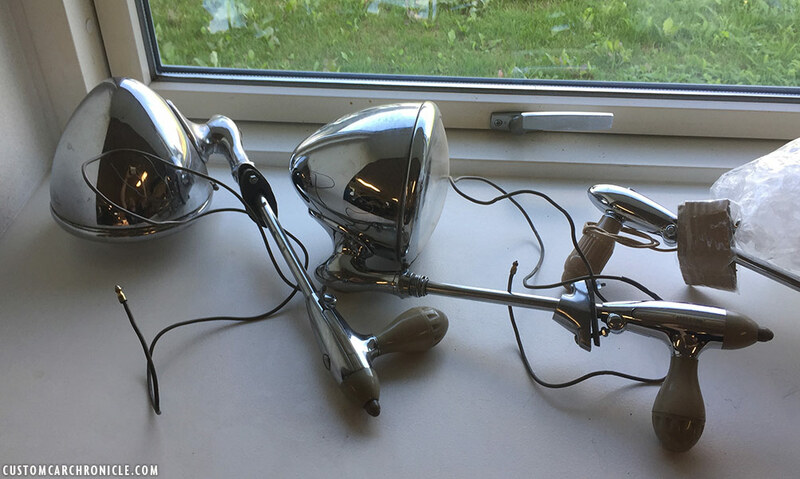 The Appleton S-522 Spotlights are patiently waiting to be remounted on the car again… soon I hope. Dreaming of going on another Road Trip with Palle Johansen… Now with the primer white Jack Stewart Ford. Reliving the times Jack Stewart, Jim Skonzakes and Bob Drake, all known previous owners had shared with us with huge smiles on their face. Great article Rik!. I saw that you had been in Denmark visiting Palle on Instagram but didn’t realize you had your son with you must have been a lot of fun. thanks again for you guys to come visit me…as you state..i am not going to over restore the car. i think its cool to see the ´mistakes´ made back then. 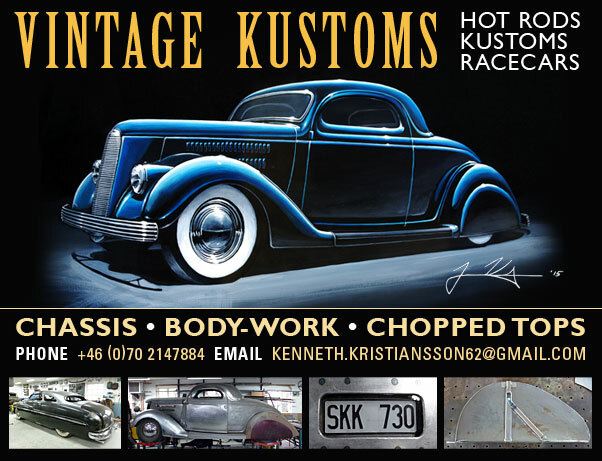 stay tuned..
Fun to read about these historical custom cars. Everyone’s smiles prompted me to similarly grin like a Cheshire cat. A lot of these custom car’s started at my Brother in Laws Shop “GIL’S AUTO BODY WORKS” in EAST LOS ANGELES on Olympic Blvd Right off Indiana Blvd.,Gil & Albert Ayala were the best ,Al doing all the chopping and Gil the painting,what a team,so proud of them both RIP.in custom Car Heaven .ur LOVING brother in Law Bob Selva………….